You may (or may not?) know that John Elway was a two sport athlete coming out of Stanford University. His most notable exploits came on the football gridiron but he also played for the Stanford Cardinals’ baseball team in 1980 and 1981. Elway showed enough raw talent to have Yankees’ owner George Steinbrenner totally enamored with the prospect of having Elway's services in right field for the Bronx Bombers. The Yankees used their 52nd overall pick of the second round to draft Elway in the 1981 MLB draft. Elway received a $140,000 signing bonus and in the summer of 1982 played for the Yankees' short season affiliate Oneonta Yankees in the New York–Penn League. Then the 1983 NFL draft came around and the Baltimore Colts selected Elway as the #1 overall pick. That’s when the drama started because Elway wanted no part of the Colts so he leveraged his baseball career to force a trade. At the time it looked like a prima donna move but looking at it now it was a shrewd move with the Colts not being the stablest of franchises and him going on to cap his 16 year career in Denver with back-to-back Super Bowl victories. 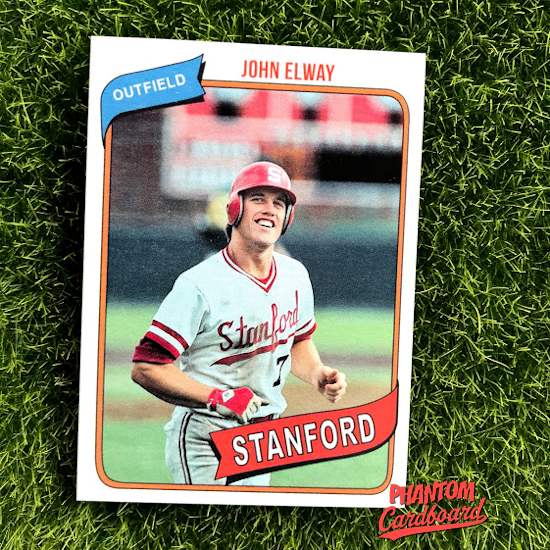 I came across some good quality pictures of John Elway playing baseball so naturally I wanted to do a card of him. I quickly also found out that Topps themselves did an Elway baseball card in 2014 using their 1981 template. Undeterred I just went a year earlier since he did play Stanford baseball in 1980. I used the color scheme that was used on the New York Yankees that year for reasons I assume are obvious if you are on this paragraph by way of the one above it.